'This is your one chance. You have your secret dreams. Follow them! Make them come true . . . 'In a poor village in northern China, a small boy is about to be taken away from everything he's ever known. He is so afraid, but his mother urges him to follow his dreams. For soon he will become a dancer, one of the finest dancers in the world . . . 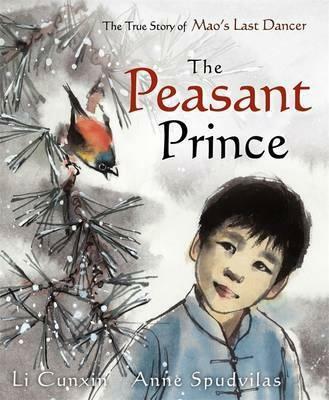 So begins The Peasant Prince,, The true story of Li Cunxin's extraordinary life. Based upon his internationally best-selling memoir, Mao's Last Dancer, this remarkable picture book captures the essence of one of the most inspiring stories to come from China in many years. With hauntingly beautiful illustrations by award-winning artist Anne Spudvilas, Li's journey of courage and determination is simply told, and as powerful as any fairytale. Li Cunxin was born in 1961, in the New Village, Li Commune, near the city of Qingdao on the coast of north-east China. The sixth of seven sons in a poor rural family, Li's peasant life in Chairman Mao's communist China changed dramatically when, at the age of eleven, he was chosen by Madame Mao's cultural advisers to become a student at the Beijing Dance Academy. After a summer school in America, for which he was one of only two students chosen, he defected to the West and became a principal dancer for the Housten Ballet. Li's autobiography, Mao's Last Dancer has sold over 400,000 copies and has been published in over 20 countries. A children's version of the book was released in 2005.